A photo provided by NHTSA shows the area in which drivers’ feet have become stuck. The arrow shows the actuator flap that interferes with the movement between the accelerator and brake. A years-long investigation into whether or not some 360,000 Nissan Versa and Note vehicles contain a defect that results in delayed brake application and unwanted acceleration gained momentum recently as the National Highway Traffic Safety Administration’s initial evaluation revealed enough issues to upgrade the scope and significance of the probe. The preliminary investigation, which began last summer [PDF] and included model year 2012 to 2014 Nissan Versa hatchbacks, sedans and Note vehicles, was updated by investigators to an engineering analysis now covering only model year 2013 to 2015 Versa sedans and Note vehicles. An engineering analysis is one step below a recall, and involves NHTSA investigators recreating the issue in a lab setting. According to a notice [PDF] from NTHSA, investigators have received 11 complaints about the issue, including one that resulted in a crash with minor injuries. 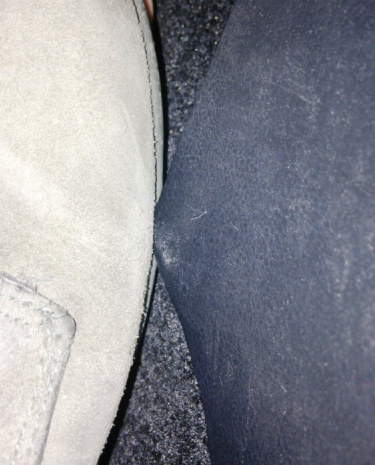 A photo provided by NHTSA shows how a foot can become stuck because of a possible design flaw in the Nissan Versa and Note vehicles. 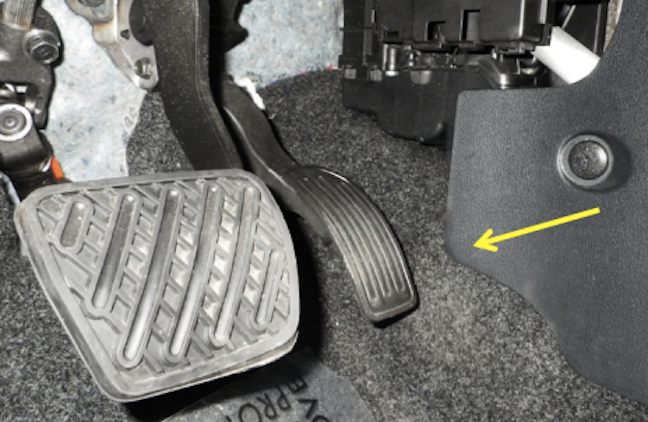 As with the original probe, the upgraded investigation centers on allegations that the tunnel carpet cover trim panel (located near the vehicle’s pedals) can interfere with the driver’s ability to promptly release the accelerator and transition to the brake. Additionally, NHTSA is now investigating the possibility that the HVAC relay actuator can also interfere with the driver’s ability to react quickly to apply the brakes. When the agency first opened the probe in June 2014, it had received one complaint that alleged the driver’s foot became caught by the trim panel to the extent that he had to physically pull his leg to get the foot free from interference, nearly causing a crash. Since then, NHTSA say it has received additional complaints surrounding the possible design flaw. NHTSA reports that the updated scope of the investigation – which no longer includes the 2012 model year Versa – was initiated after regulators determined the model year 2015 Versa and Note vehicles to have the same panel design and actuator placement as vehicles involved in the consumer complaints. Nissan tells Reuters that it is also analyzing the issue and cooperating with NTHSA. Previous Study: Which Commercial Diet Programs Are The Most Effective?